I'm receiving frequent requests for solving the question on "counting the number of faces" that appeared in CEED 2013 question paper (as shown below). This is a complex geometric solid, which will probably confuse you and will consume more time. For this, I had given step-by-step solution in the form of pictures with arrows to locate the faces. Remember that you need to visualize this mentally, for arriving to the final answer without putting pen or pencil on paper to save time. You may get the downloadable format of this guide at the end of this page. Let us now count the faces from front direction. As you can see I considered the semi-circular portion (numbered 5) as a single surface. So totally you will be counting 6 faces. Now count the number of faces from the right direction as shown below. Note that I counted the two slant surfaces ( numbered 5 and 6) in this direction. You may even count the slant surfaces from front direction, provided you neglect the same from right side view. It's up to you to decide and count. Counting for number of faces from back side will give four faces as shown in the below picture. 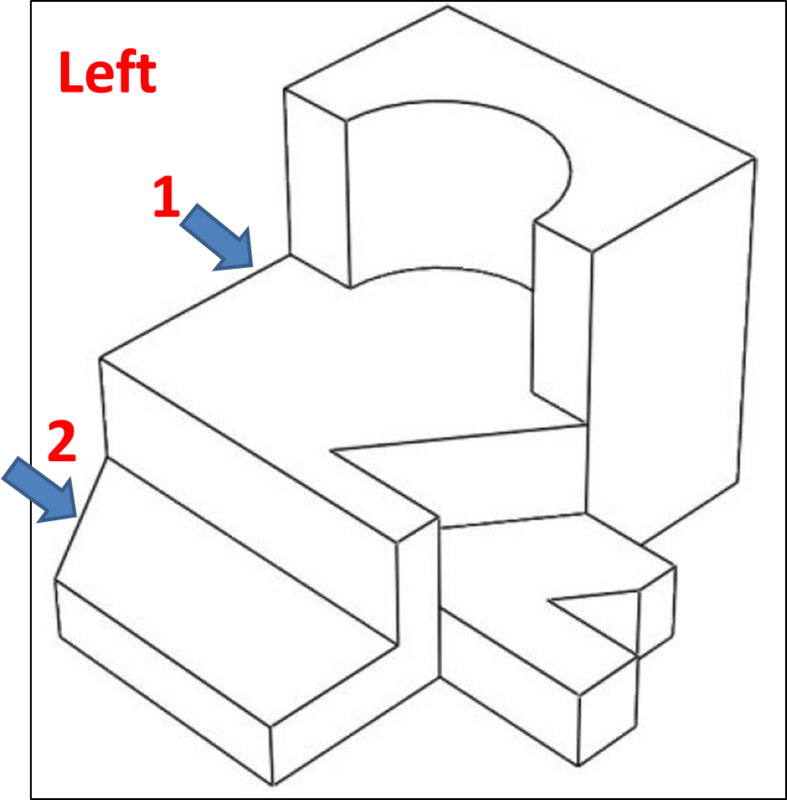 Counting from Left direction is a bit trickier, as you may visualize only one surface, but in fact you should be seeing two surfaces as shown in the picture below. Remember that the surfaces which are not in the same plane cannot be counted as a single face. Now, we will count the number of faces that can be seen from top direction. You should be counting four faces as shown below. Finally, you need to count the number of faces from bottom. I visualize only one surface, because all the individual shapes are in same plane. Thus summing up the counting in all directions, you should now get 23 as answer (option 2). I hope you enjoyed doing this. thank you so so so much....! can you please post a link for more these type of questions.? in this question you are not talking about bottom view???? It's already mentioned (I mentioned that in written form instead of including image) after the last image. Pl check! What are the common topics from nata and nid that might appear in uceed? What exactly does it mean when you say "not in same plane"? Please elaborate. Then how come in the "Right" surfaces, the mirrored 'L' shape is counted as one surface? 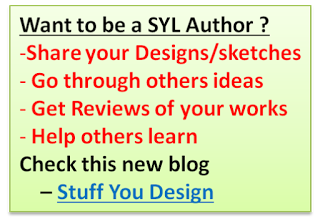 Your blog is a great help not only to UCEED but also NID and NATA aspirants. Could you post sample papers of uceed(if any) as there is just one previous year question paper available. we will count them two different surfaces ?? is it a rule ? 1 and 4 are not in the same plane! they are in different planes. 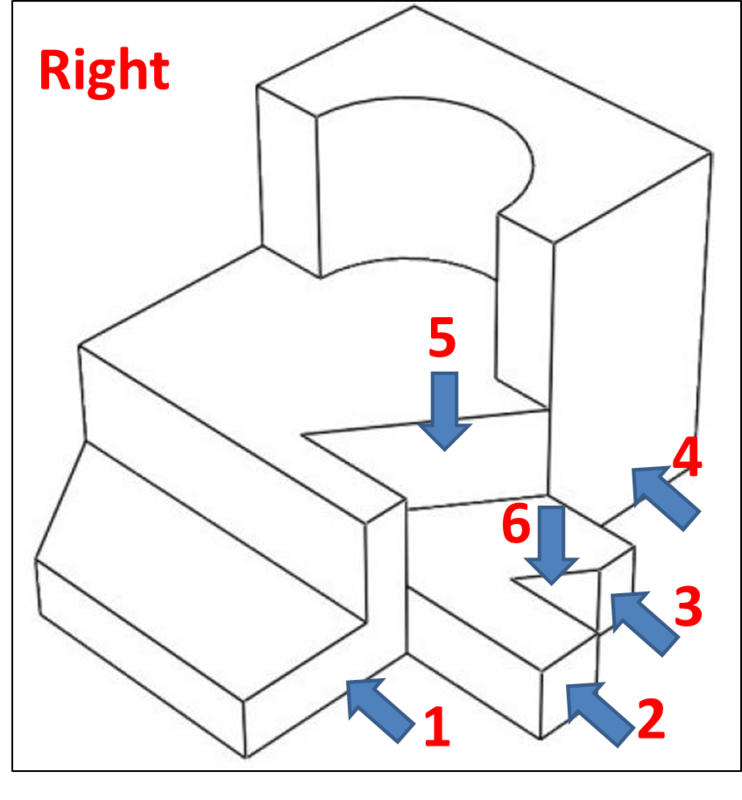 Simple find is you can check at what level (height) they are compared with any reference (generally we can consider the bottom most solid plane - the plane on which the solid is assumed to rest as reference) , plane 1 is little raised in height in compared to 4. I hope you got now. kindly if you suggest me something for block Counting,because I face a lot of problem in it. its ans is 21 ? sir i am confused how 23 is ans ? What's there to confuse ? I've clearly indicated with arrows for all sides in the above images. Check and do let me know if u feel like I've repeatedly counted twice any surface. Btw where did u get this ans 21 ? hey, i had a doubt whether we are supposed to count base surface too.....for counting no of surface? I've not showed that in image, but have mentioned that in the paragraph following the last image, u have to note that. In your video,for the second figure you have counted the cylindrical surfaces in your views. Though the surfaces are actually visible, how can they be counted in any particular view. In top/ bottom view they would be visible as circles. In front/left/right view they wouldn't be visible at all. Ur ques is bit confusing, but anyway i will try to answer what I've understood from ur writing. In top/bottom view, like u mentioned, circles will be visible, to be precise, we say them as holes, but it doesn't reveal any surface since the surface walls are perpendicular to that direction and so we cannot take them from top or bottom. Like I mentioned in the video, usually in a given solid, there might be several surfaces which might appear in different views. So, the point is if you have already identified/counted one surface, then you should avoid counting them in the other view, since we are focused here on finding the no. of SURFACES, and not counting on no. of times the surfaces are visible. The cylindrical surface could be seen in the front, left as wel las right, but it's all about only surface but viewed in diff directions, So it counts to only one surface. Hope you are getting me. the holes in the surface that you mentioned, wouldn't be visible in any of the six views if considered perpendicular to the surface. So can I assume that if there is any hollow shape(circle, square, rectangle) identified on any surface in any views, I consider them as surfaces and add to the count once? I think you need to go through some sample qustions for better understanding. The thing is, so called 'holes' on any solid surface appears because of a cut in that surface, it might be circular, rectangle etc like u mentioned, but such holes are visible from at least two directions. Consider the cylindrical hole on the front face of the shape (second one in the video) you can see the hole in the front as well as back views, but the surface representing the hole isn't visible in either direction, But they can be IMAGINED to be seen in the top or bottom views only or in the right or left directions. There's a terminology in engineering design called 'cut views' or 'sectional views', in which if we cut the solid in the direction in which we are viewing whether we see the surface or not is what we are trying to see. 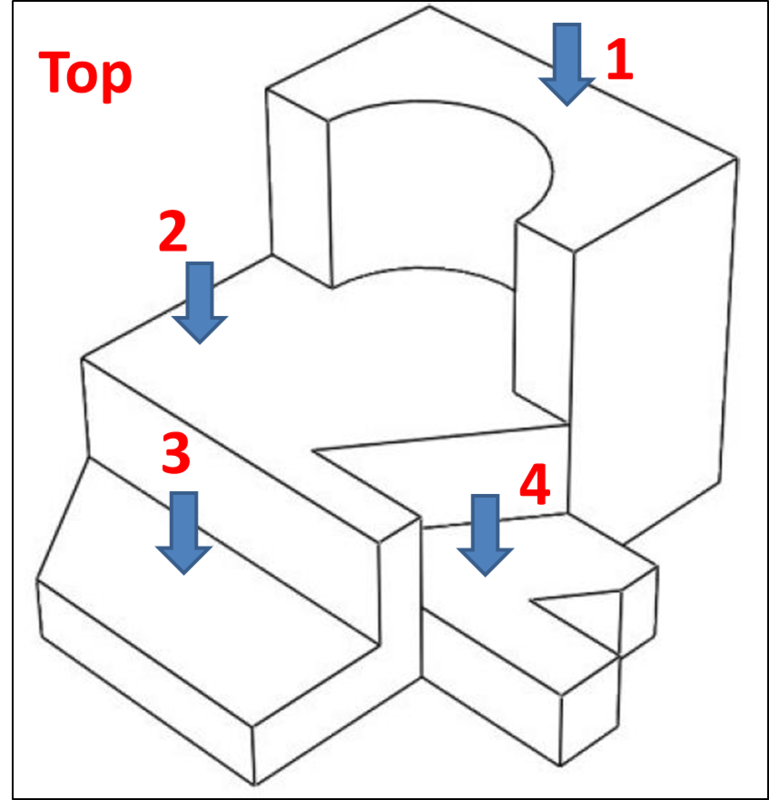 It's hard to put in words, I will try to make images for better explanation - some time later, but I suggest you to solve more such questions to try to remove your confusion and also search the web about cut/sectional views and see if that gives you some idea of what you are missing. Thank you for the explanation. The engineering terms have solved the confusion. I will surely check more solved questions. Sir You are doing great by helping us!! 1. Do you have some practice questions for this topic of counting the surfaces? 2. Can you provide some help for practice questions on ths topic? 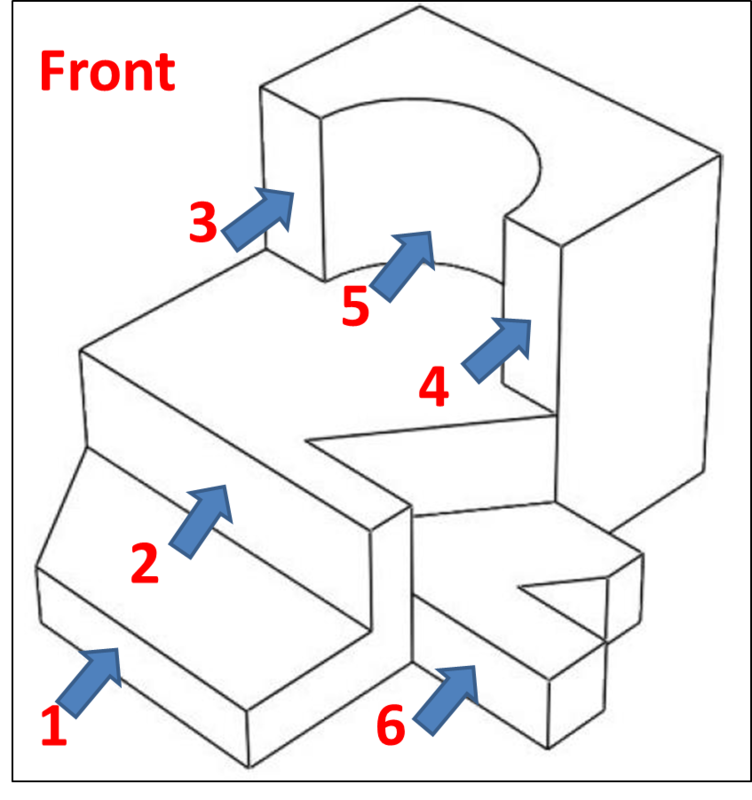 try them in google images, use keywords like 'isometric solids', '3d solids' etc. 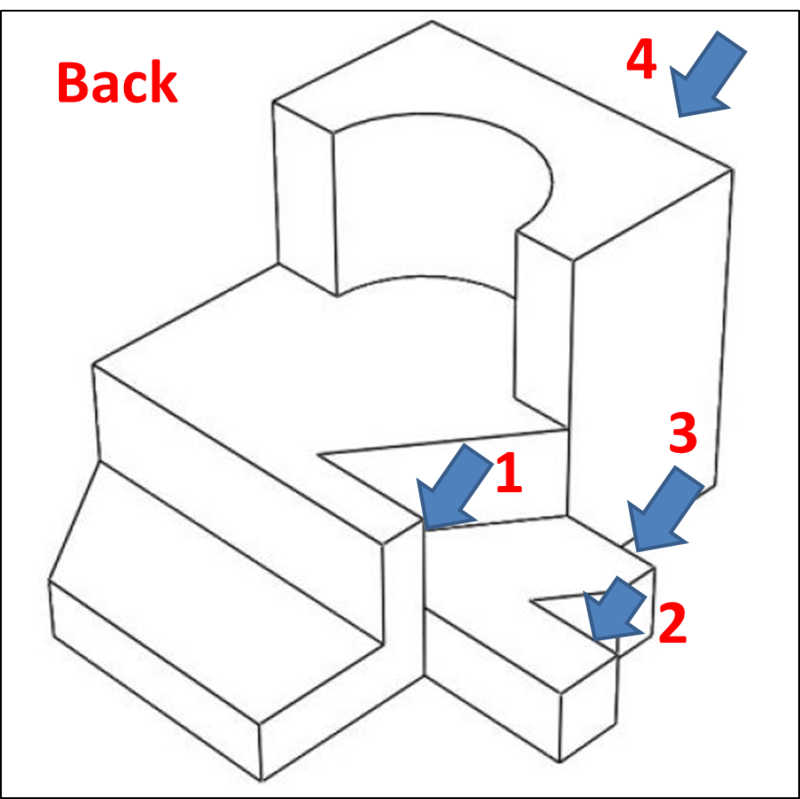 Hi sir, what about the bottom surface (the base) of this image? You also not counted it as a surface. Please clear my confusion. Sir why u not counted the bottom surface of this image? I am too confused about base surface. Please give your suggestion. Thanku sir, u counted the bottom surface too. my confusion is cleared now sir. Thanku for ur support sir. Sir, I think in the video you uploaded, you forgot to count the back surface. Should we consider that surface as 1 or 2 (the second example you gave in the video. Please do clarify my doubt sir. I haven't refereed the video but what I understood is you are not considering adjacent surfaces on the same plane as a single moulded surface. That being said, the answer shall be 1 only.